Ken Schram Photography: Composition and the "Wandering Eye"
Composition and the "Wandering Eye"
Last week we discussed the "Rule of Thirds" and how it can help you to compose more interesting photographs. If the goal is to tell a story with your images, I find it helpful to ask myself questions as I frame the shot. Where is the subject going? What is the subject running from? What is the subject looking at? How can I take the viewer on a "trip"? If you discipline yourself to remember you're trying to tell a story, you will see an immediate improvement in your captures. You will have moved from taking snap shots to taking photographs. 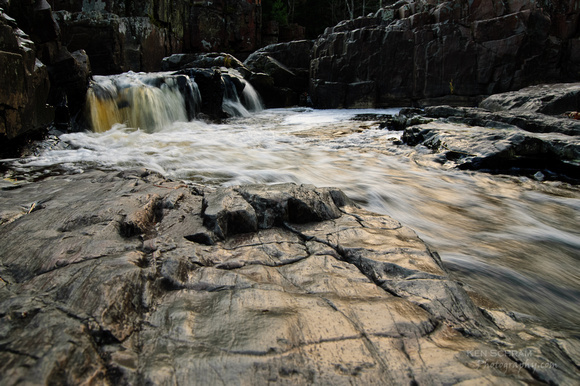 Notice how in this shot, the waterfall is in the upper left corner intersection and the rushing water cuts diagonally across the frame. 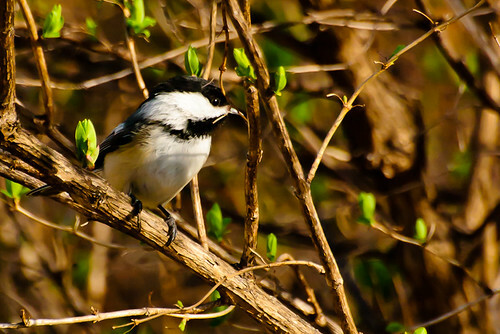 In this shot the chickadee is placed along the left third of the frame looking to the right. Aren't you curious as to what its looking at? This shot has also captured what my wife refers to as "the glint" (also referred to as "catch light") in the eye to provide additional interest. 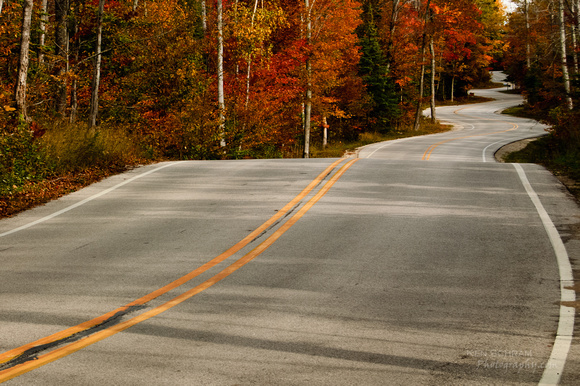 This image of a twisting road takes you on a journey all by itself. Starting with the double yellow line in the foreground, the viewer is treated to a visual journey that transports them through the entire frame to the "payoff" in the upper right intersection. As the article linked to last week's post pointed out, however, the Rule of Thirds is a good guideline to help you when composing your photographs. It is not THE LAW. Fill the Frame - When you're shooting portraits or wildlife and are in a position to "fill the frame", do it. Forget the Rule of Thirds. Focus on the eyes and click away. Reflections - When you find an interesting scene with a mirrored reflection, these types of shots scream "break the rule, break the rule!". Instead try breaking the image right through the center with the mirrored reflection occupying equal space. Lose the Clutter - If you're shooting an interesting scene, but there's a pile of garbage detracting from the shot, crop it out. If something in your image isn't contributing to the story, simply don't include it. One more thing to remember before we wrap it up for this week. You can always crop in post processing and still leverage the Rule of Thirds. That's right, the Rule of Thirds isn't just for when you look through the viewfinder. If you've taken an interesting shot that needs a little work, don't be afraid to play with different crops in post processing which leverage the Rule of Thirds to make it even better.